Gregory Porter On Channeling Nat King Cole: 'Nat Got Me Through Some Moments' Whether it's through jazz, soul or an electronic music collaboration, Gregory Porter wants to spread Nat King Cole's message that "the greatest thing you'll learn is to love and be loved in return." 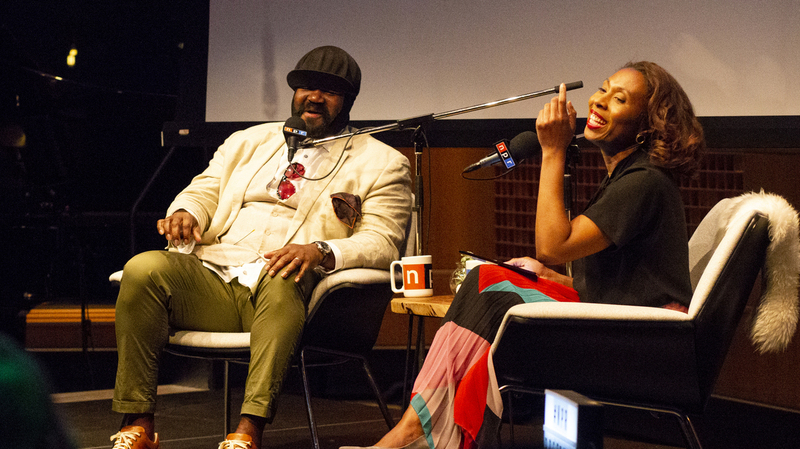 Jazz singer Gregory Porter and NPR's Audie Cornish at a live interview at NPR Headquarters in Washington, D.C. on June 27, 2018. When Gregory Porter began his career as a jazz singer, he was told to start by covering the standards. But Porter diverted from the path most new jazz artists take and produced original albums instead. "When you have something to say, you can't really keep it down," he says. Two of those original albums, Liquid Spirit and Take Me To The Alley, earned him a loyal fan base and two Grammys for best jazz vocal album in 2014 and 2017 respectively. Now, he's circling back to the standards through his musical idol Nat King Cole in his latest album Nat "King" Cole & Me. As part of NPR's live interview series, Porter spoke to NPR's Audie Cornish about interpreting Cole's music as well as working with unexpected collaborators like electronic music duo Disclosure. Read the edited conversation below and hear their full conversation at the audio link. Gregory Porter: This record — I don't want to sound insensitive — it's for you, but it's for me. Nat got me through some moments, you know what I mean? When my mother was sick, when she did pass, I went and re-medicated myself with his music. It has an important place in our household. I can smell the greens on the stove and the cornbread in the oven when I hear Nat's music. I wanted to have his music come through my body, come through my vocal cords, and sing it as an expression of appreciation for him. Audie Cornish: Back during that time, and for some years after, there was criticism of Nat King Cole, right? People thought his music was saccharin, especially during the racial climate he was singing in. He got obviously a hard time from black audiences as well as white audiences for different reasons. So how does his music speak to you today? You know, I think it should even be re-evaluated for that time, the '50s and the '60s. It was rough, right? I mean the attitude was kind of like, "Well, white people like Nat King Cole, so ..."
Think about the time. My mother had always been a fan of his music. This is something I did one day: Imagine her, after coming home from some protest movement or march and putting on, "Smile though your heart is aching, smile even though it's breaking." Imagine her putting on, "Pick yourself up, dust yourself off, start all over again." I see the optimism and the strength and the resurrection of spirit in his music. I like to think, without question, Nat knew who he was. He knew he was a striking, tall, dark-skinned black man. He was performing in the South, and they let him know who he was by calling him names and attacking him and breaking his piano bench and injuring him a little. He knew who he was, but I have to think he knew that maybe his songs had one meaning and one feeling for one group of people. For that suburban 30-year-old white woman in the suburbs, it had one feeling, one meaning, and for my mother it had a different meaning. He put something in there for her. When you were first starting out, people wanted you to do a standards album, right? When you do your big debut as a jazz singer, you're supposed to show, "Look, I can nail it on the standards," and then you totally didn't do that. What was the discussion like? How did people try and convince you? Why did you reject that argument? Pretty much everybody was like, "Don't come out trying to write your own music. You're a jazz singer. Do the standards and then after maybe the second or third record, then you can get into your own writing." But there's something in the artist — and in people, period — that when you have something to say, you can't really keep it down. I had a plan, but I had some things that I wanted to say. Writing from a personal experience can bring about this emotion and power of emotion that can be instantly connected to the instrument, my voice. I don't have to conjure up an idea of standing on a hillside with my hair blowing in the wind. When I sing "Mother's Song," "Insanity," even "Holding On," all of these things I have a connection to. I'm glad you brought up "Holding On" because you have not shied away from letting other people interpret your music. That is a great example of an instance where somebody did that, and this is from the group Disclosure. This is like Ibiza Gregory Porter. You perform this in your sets, right? What do you do, you're like, "Now for something different?" The way that this song came about was they called me into their studio and was like, "Hey, let's write a song together." Essentially I wrote this song and they went into the laboratory and electrified it. The song is essentially a soul song. "Weight of love on my shoulders. I thought that it would be easier than this." How does this song connect to Nat King Cole? The optimism. The optimism about the power and the strength of love. This connects to the greatest thing you'll ever learn is just to love and be loved in return. What I'm saying in this song is that I tried to kill it, tried to stomp it out, tried to get rid of it, tried to burn it, and it wouldn't die. Love is holding on. I can't get rid of it. I also like the fact that I can have 17 to 25-year-olds all over the world jumping and dancing to this song. They're still getting the message. They're still getting "Love is holding on." And I can take it and do it in my own set and do it as a jazz song. And the jazz lovers, guess what? Can I get an amen? Because ultimately I'm a child of a preacher.